Langston Hughes wrote Samuel Battle's biography, Battle of Harlem, more than fifty years ago. 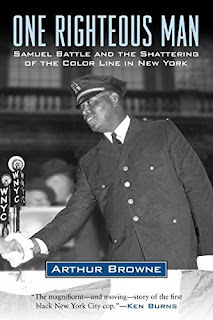 It was about the life of the first black policeman in New York City. But no one wanted to publish it. So Battle had another friend revise the manuscript, and Eleanor Roosevelt wrote the Forward. Still, no one wanted to publish it. 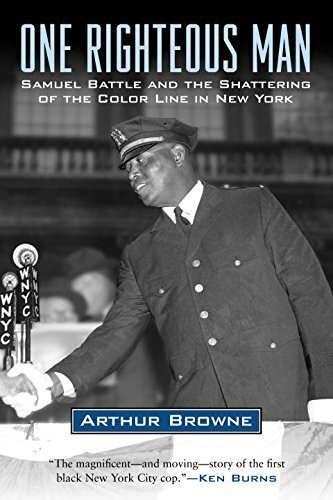 Now, Arthur Browne, who has probably written more about New York and prominent New Yorkers than anyone else, has gotten Beacon Press to publish his book on Samuel Battle. Arthur Browne has taken the revised manuscript, interviewed Battle's surviving friends and relatives, researched more, even changed the title, and presented his book on Samuel Battle, not in color, but in black and white—and sometimes black versus white. Because when you pull the shade up and look out the window on race relations in America, it's not a pretty picture. I am, of course, referring to Black and White America as it was from the early 1900s to the 1950s. Or am I? There will be those who will adamantly refuse to read this book, yet will still sing God Bless America. Are you one of them?